Historically herbs that promoted the production of hydrochloric acid called bitters were incorporated into the after meal festivities to help digest foods. The bitters used in alcoholic drinks, the aperitifs from France, Italy, and Germany carry traditions to help digest your meal. Apple Cider Vinegar is 10% hydrochloric acid. The stomach has two closing rings. One at the bottom allowing the stomach to fill up and one at the top to close off the stomach so the food can be mixed with hydrochloric acid breaking down proteins. The stomach will do a very good job of compartmentalizing the proteins that need the hydrochloric acid to be broken down with an accordion action. Once things are mixed the bottom ring will open and the food will follow into the small intestine for complete digestion by Pancreatic Enzymes and the Liver with the Gallbladder to finish the breakdown of fats. 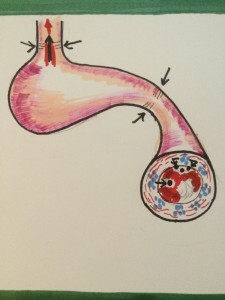 From there the small intestine absorbs nutrients. The Large Intestine for the most part removes water and forms the waste for removal. There are homeopathic formulas to aide the Gallbladder in breaking down fats and to take swelling out of an overworked Pancreas to further help with digestion. The most common digestive issue is reflux. The muscle ring that closes off the top of the stomach can have a bad nerve signal and it will not completely seal. What happens is the ring muscle cells have lost the ability to detoxify properly and cellular debris blocks the nerve impulse to close. This is experienced as reflux as the gastric content is pushed into the esophagus. We use an amino acid to clear the ring of debris for people who have this issue. Reflux can also come from an inflammatory reaction as the food leaves the Stomach and enters the Small Intestine and begins absorption. If we are eating a food allergy, white blood cells identify the absorbed allergen and will explode causing a spasm. Dr. Pyers identified these patches of protective white blood cells, and today they are called Pyer’s patches. The inflammation from the exploding white blood cells can cause diarrhea, constipation, or reflux. Dairy fats are hard to digest and they tend to be the number one food allergy causing the inflammatory reaction. If you experience indigestion during the Holidays cut back on the butter in the meal. Try this version of Dairy Free Pumpkin Pie. 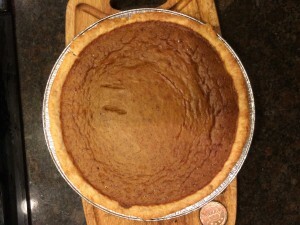 It is much lighter and less filling than the conventional Pumpkin Pie we are all used to. I also have suggestions for diabetics and people allergic to sugars. Feel free to use the spice mixture you enjoy. The only difference with this version is the removal of the dairy using canned Coconut Milk instead. We want the Coconut oil so use the standard canned Coconut Milk, not the LITE version. I used the back of the Libby brand canned Pumpkin recipe and a Martha Stewart book called PIES & TARTS. Martha used Maple Syrup as the sweetener and I prefer this, it gave the pie a better taste than sugar. Her recipe called for 1/2 cup of Maple Syrup, I used 1/3 cup. It depends on how sweet you like things. If you are allergic to sugar or a diabetic use Agave syrup. Agave is treated by the body as a food and will not cause a glycemic spike. Agave is also not considered a sugar for people allergic. 1 13.5 ounce can Coconut milk. Mix all ingredients and pour into an 11 inch pie crust. Bake at 425 degrees fro 15 minutes then reduce heat to 350 degrees for 45 minutes or until a knife blade is removed clean from the center. 2 1/4 cups unbleached flour. 1 cup of cold Lard or Vegetable Shortening. 1/2 cup of cold water. You may need 1/4 cup more of water. 1/2 teaspoon of sugar is optional. Combine and roll out as you normally would and form to the pie tin.